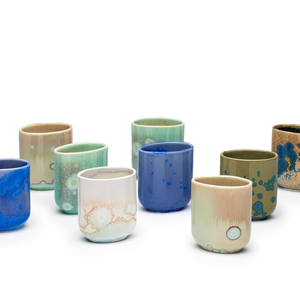 The simple tactile form of the cup, handmade out of fine imperial porcelain, truly brings the attention to the sheen and texture of the glaze. Available in colours Opal, Wattle, Sapphire, Turquoise and Amber. Please specify your choice in 'Special instructions' field when you place your order. The complex crystalline effect is achieved by growing crystals in the molten glaze under the extreme heat and pressure of the kiln. Each glaze is a unique recipe mixed up from up to 10 different minerals that reveal their vibrant colours in the firing. A lot of testing and refinement is involved while creating the recipes to make sure the glaze shows off its best qualities. Nevertheless, each piece still takes its own identity in the firing and is completely unique and unrepeatable. R L Foote Design Studio is a Melbourne - Hong Kong based design studio focused on delivering some of the most unique and contemporary ceramic flatware, interior design objects and event based designs. We meticulously create everything in our Hawthorn East studio workshop.